The Thermo Napco 800DH Double Stacked Incubator offers you precise temperature control, and uniformity across all your culture parameters. This direct heat incubator prevents contamination with rapid HEPA filtration, that gives you Class 100 air quality in under 5 minutes. 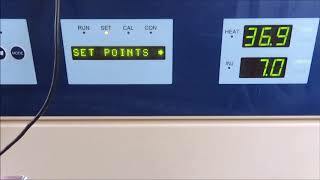 Sterilization of the unit is also easy to manage with a high temperature decontamination cycle, that can be run overnight to ensure elimination of all microbial life within the chamber. The Thermo Napco 800DH Double Stacked Incubator has a capacity of 6.5 cu feet per incubator and is constructed of 28 gauge cold rolled steel. The interior is built out of coved cornered stainless steel for easy cleaning with simple to remove stainless steel shelves. This CO2 incubator has a temperature range of +5 above ambient to 50°C with a uniformity of ±0.3°C and uses an IR sensor. Various alarms alert users to parameter deviations such as over temperature, and humidity. This Thermo Napco 800DH Double Stacked Incubator has been calibrated per factory specifications. All of our lab equipment comes backed with our standard warranty. Should you have any questions, please don't hesitate to contact us.